Fabulous panoramic views from our sunny deck. Open plan, full service restaurant, with seating capacity for up to 150 guests. Serving breakfast, lunch and dinner daily throughout the golf season. Kids menu as well as daily and weekly specials available. Cocktail functions available for up to 230 guests. Air-conditioned for those hot summer days. Beautiful wrap around deck with full food and beverage service. Friendly, professional, fully certified service staff. If you are interested in our golf tournament Food and Beverage Packages or for more information on booking weddings, meetings or special events call 250-423-4115. Built in 1996 and recently renovated, our 5000 square foot Clubhouse boasts some of the most majestic views in the country! 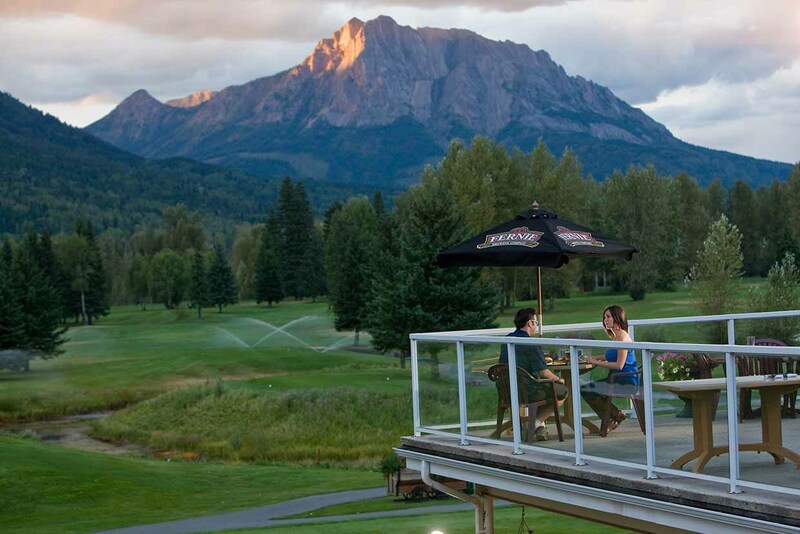 Sitting out on the deck after a round of golf, having a cool drink or a bite to eat, with Fernie’s majestic Ghostrider Mountain in the background, is as good as it gets, here in the beautiful BC Rockies. With a stunning wrap around deck and numerous photograph locations, this corner of the Canadian Rockies is also a popular choice for hosting your wedding or special event. Let the F&B staff help you to plan and ensure the success of your special day.